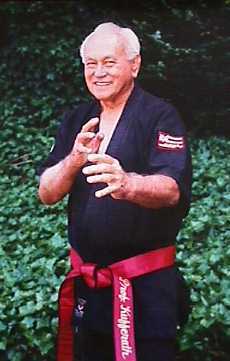 Professor Sig Kufferath (1911-1999), 10th dan, Danzan-Ryu Shodai Keishosha, Jujutsu Shihan. 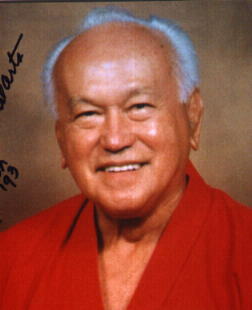 Prof. Sig Kufferath, 10th Dan (1911-1999) was the Headmaster of the Danzan-Ryu Jujutsu system. 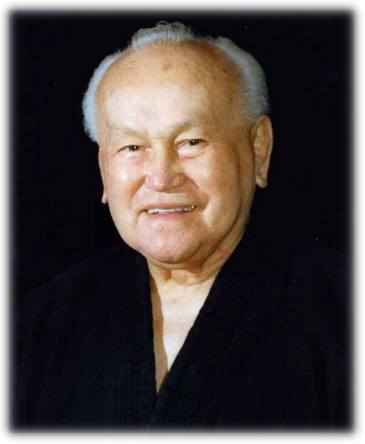 He was the most senior student of Professor Henry S. Okazaki and an active teacher of Danzan-Ryu Jujutsu until shortly before his death in 1999. 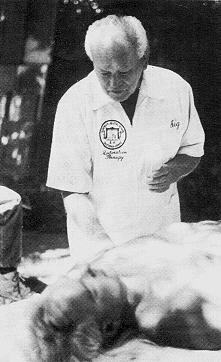 Born Siegfried Kufferath (he preferred to be called "Sig") on February 16, 1911 in Honolulu, his father was a former consulate to Japan from Germany. His mother was Japanese. As many as 11 different languages were spoken in the Kufferath home. As a student at the University of Hawaii, Kufferath excelled in track. In 1937 he was asked to visit the Jujutsu class of one of his neighbors. That neighbor happened to be Henry Seishiro Okazaki. Thus began Kufferath's long journey in the martial arts. 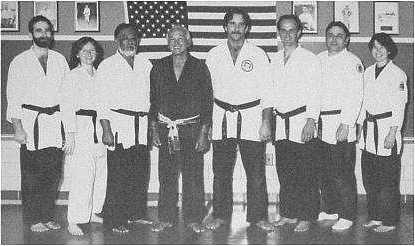 In 1941, Kufferath received his first degree black belt from Okazaki and also received a Mokuroku (teacher's scroll), an honor usually reserved for second degree black belts. 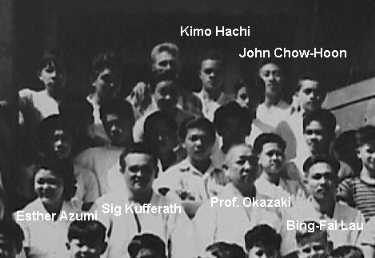 Along with his teaching partners Bing-Fai Lau and Esther Azumi (later Takamoto), Kufferath instructed at both the Kodenkan and Kaheka Lane dojos. Kufferath learned the entire system from Okazaki and since he knew Japanese, was taught the system in that language. He also learned the Seifukujutsu, techniques of adjustment and restoration, and continued to teach and practice these arts until shortly before his death. 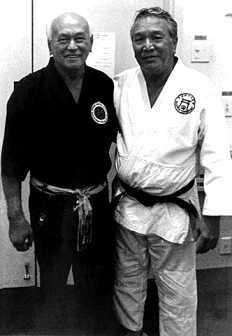 In 1948, Kufferath attended a Special Black Belt Class given by Okazaki for his black belt instructors. 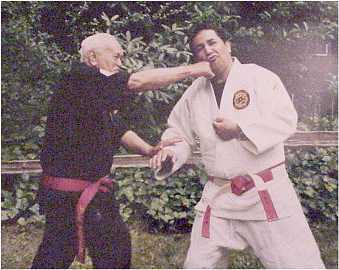 Upon completion of this course, he received a Kaidensho (certificate of mastery) and was given the title of Shihan. 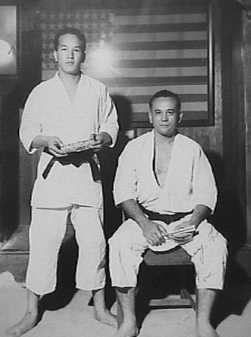 After Okazaki's death in 1951, there was a leadership void in the American Jujitsu Institute (AJI). In 1952, the AJI membership elected Kufferath to succeed Okazaki as Professor. Kufferath continued in this position until 1960, when he moved to the mainland. 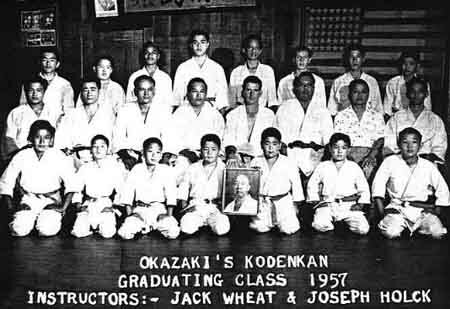 In the summer of 1993, Professor Kufferath repeated the 1948 Special Black Belt Class, that he and his senior student, Tony janovich renamed the Kodenkan Jujitsu Okugi ® for a group of Danzan-Ryu instructors, thus passing on the Okazaki tradition to a new generation. 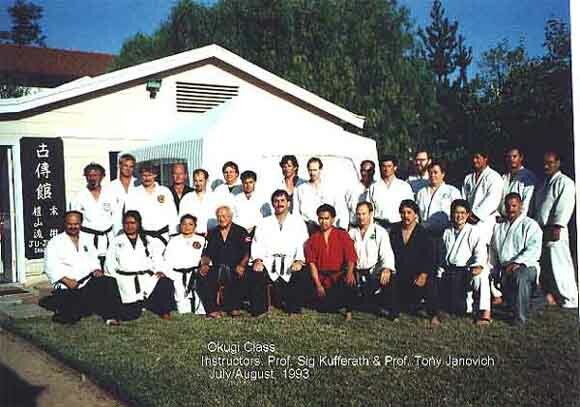 The next Kodenkan Jujitsu Okugi® was planned by Prof Kufferath and his senior student Prof. Tony Janovich prior to Kufferath's passing. 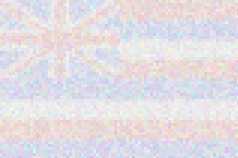 It is now scheduled for early 2003. Professor Kufferath also held black belt ranks in Judo and Aikido. Prof. Kufferath passed away at his home in Santa Clara, CA on May 7, 1999 with his family and friends at his side. He lived a long, full life and made an important contribution to many persons lives. His teaching and therapy lives on through his senior student, Professor Tony Janovich of the Kodenkan Jujitsu and Restoration. Prof. Kufferath will be missed by all who knew and loved him. 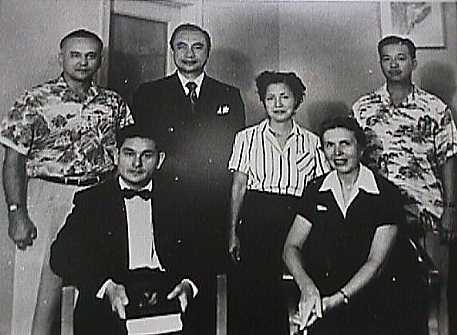 Sig Kufferath receives his instructor scroll from Prof. Okazaki in 1942. 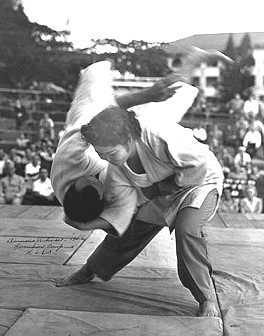 Kufferath throwing Bing-Fai Lau with a Hane Goshi in 1942. 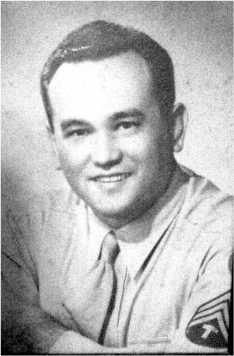 Sig Kufferath as a Tech Sergeant in the U.S. Army, circa 1946. The Kaheka Lane Dojo of Sig Kufferath and Bing-Fai Lau. Sig being thrown Tora Nage by Esther Azumi. Instructor Kufferath with the Kodenkan children's class. 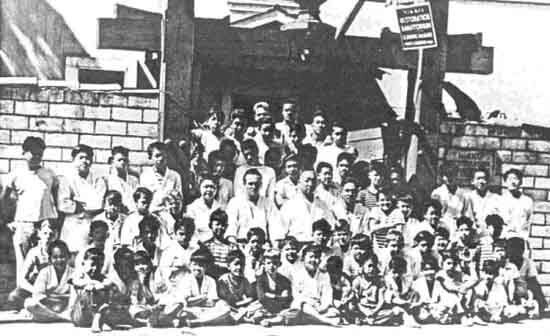 Close-up of the Kodenkan children's class. 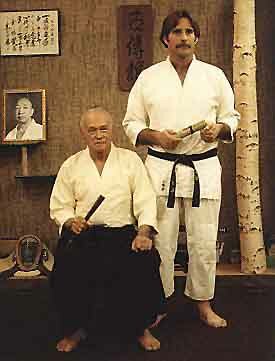 Instructor Kufferath presents the Mokuroku to his student, Joe Holck. Prof. Kufferath attends the graduation of the children's class of Jack Wheat and Joe Holck. Prof. Kufferath (standing left) visits the home of his friend, James Mitose (seated left). 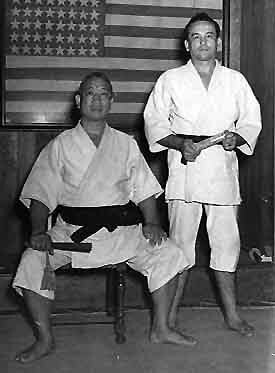 Mitose was the Grandmaster of Kosho-Ryu Kempo and teacher of William Kwai-Sun Chow-Hoon. 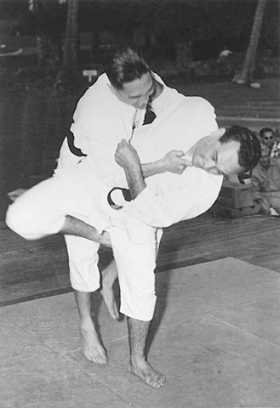 Williams's brother John Chow-Hoon studied Jujutsu under Prof. Kufferath. Standing at the right is Thomas Young. Prof. Kufferath awards an instructor scroll to Tony Janovich. Prof. Kufferath teaches a class in Ohio in the 1980's. (L-R) Dan Furhman, Mary Boland, Lono Ancho, Sig Kufferath, Tony Janovich, Doug Kiehl, William Gessner, Barbara Gessner. 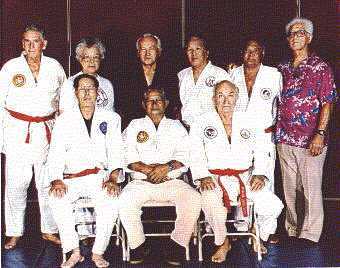 Prof. Kufferath (back row in the black gi) with other Okazaki students at the 1990 Ohana celebration. 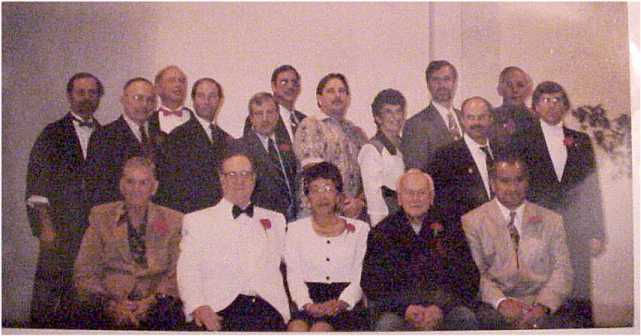 A gathering of Professors at the 1992 Ohana. Seated (L-R) Jack Wheat, Lamar Fisher, Louise-Imiko Okazaki-Mullins, Sig Kufferath; Standing (L-R) Herb Lague, James Musselman, John Congistre, Rory Rebmann, Pat Browne, Clyde Zimmerman, Tony Janovich, Jane Carr, Don Cross, Bob Hudson, Tom Jenkins, Tom Ball. Prof. Kufferath demonstrating Tanto Hibara Hazushi with Prof. Tony Janovich as uke. Prof. Kufferath with his student Prof. Joe Holck in 1990. 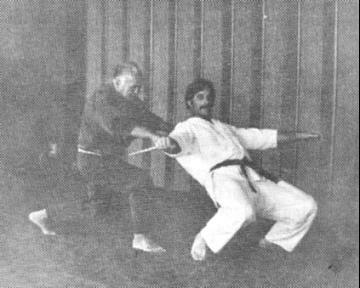 Prof. Kufferath performing Seifukujutsu on Sensei Hans Ingebretsen. Prof. Kufferath punching out Prof. James Muro. Prof. Kufferath assumes a defensive posture in this recent photo.